It would be hard to write a review of anything by Germany’s Auld Corn Brigade without mentioning the Dropkick Murphys. 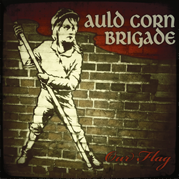 So we might as well get it outta the way, so here goes, Auld Corn Brigade’s new four track EP/10′ vinyl goes a long way to reinforce my belief that the Germany Celtic-punks are the best off the bunch of the new Dropkick Murphys inspired bands. Sure their not clones, the fiddles and the female co-lead vocals differentiates them but still, if you love the DKM chances are you’ll love the ACB – got the alphabet going here! The 4 track EP includes a great cover of the Christy Moore / Moving Hearts song of the Spanish Civil International Brigade, Viva la Quinta Brigada, and something called the Helicopter Song (about a prison break from Dublin’s Mountjoy) that must be a Wolfe Tones cover (help me out here) and two other great tracks. Recommended to lovers of Celtic-punk and especially DKM lovers. This entry was posted in CD Review and tagged Auld Corn Brigade by Mustard Finnegan. Bookmark the permalink.